In this tutorial we will build a preference screen using the PreferenceActivity class. Our main activity will contain 2 Buttons and a TextView. 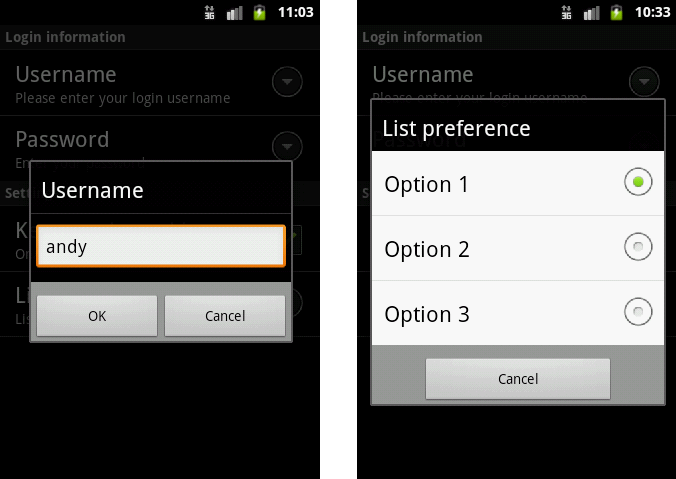 One of the buttons will open the preference screen, and the other will display the values stored in SharedPreferences. To put all this things together in a fashionable way, we will be using the PreferenceActivity class. The good thing about this class is that the definition of layout file it’s very simple. It provides custom controls specially designed for preference screens. Another good thing is that you don’t need to write code to save the values from preference screen to SharedPreferences. All this work is done automatically by the activity. 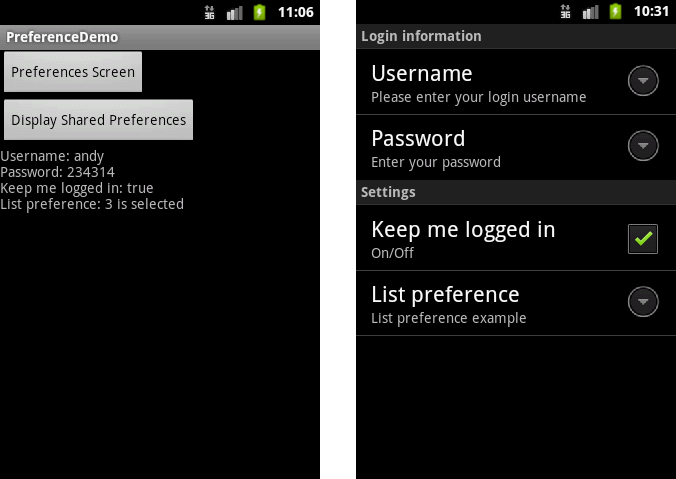 android:summary="Please enter your login username"
Notice that the root element of prefs.xml is the <PreferenceScreen> element, and not a RelativeLayout or LinearLayout for example. When a PreferenceActivity points to this layout file, the <PreferenceScreen> is used as the root, and the contained preferences are shown. <EditTextPreference> – defines a text field for storing text information. <CheckBoxPreference> – defines a checkbox. <ListPreference> – defines a list of elements. The list appears as group of radio buttons. 3. At this stage the prefs.xml might complain that the @array/listOptions and @array/listValues resources cannot be found. To fix this create a new XML file array.xml in the folder res/values/. This file will contain the elements of the ListPreference. The “listOptions” array defines the elements of the list, or with other words, the labels. The “listValues” array defines the values of each element. These are the values that will be stored in the SharedPreferences. The number of list options and list values should match. The first list value is assinged to the first list option, the second value to the second option,… and so on. Notice that instead of the traditional setContentView(), we use here addPreferencesFromResource() method. This inflates our prefs.xml file and uses it as the Activity’s current layout. 6. Now, to test our preference activity lets modify the main.xml layout file by adding 2 Buttons and 1 TextView. One of the buttons will open the preference screen, and the other will display the values stored in SharedPreferences. Here we attach 2 listeners for each button and display the values retrieved from SharedPreferences in a TextView. By this time you should compile and run successfully the application. Nice tutorial on using preferences. I’ve used them before but not with checkboxes and lists. Thank you very much. You’re setting a static listener, but I’ve never seen this done before. Is View always a default reference to the current view or something? Are you setting a click listener for the entire activity? I’m pretty new so thanks for your help, and for this nice tutorial. Let me try clear up the things. The main activity has 2 Buttons, each with its own specific purpose. Very neat tutorial! I’ve been meaning to try my hand at developing for Android! Nice work mate. Creating an avenue for people to learn. But when i click on option in list .the application gives.is there any code require when user selects an option in preference.how will it be stored in the preferences. @Kami, nope! I just implemented a Preference Activity in my program. You’re not missing anything, since your code “extends PreferenceActivity”, that “PreferenceActivity” code actually takes care of saving your preferences for you! I just unchecked a preference, and the value changed from “true” to “false” all on it’s own, even after a reboot. From what I’ve read, technically it makes a small sqlite database to store preferences, named after your app — so mine is com.fropco.UltraWifiManager, so the preferences are stored in com.fropco.UltraWifiManager_preferences. But getDefaultSharedPreferences takes care of the filename anyway. Great article, I found it very useful. Thanks! Awesome tutorial – thank you. I learned from this and even implemented a button within the preferences page. Good stuff! Nice, ty. First functional description! I tried to run this under Eclipse, and it seems that ‘addPreferencesFromResource ‘ is deprecated. I have API level 17. What’s the alternative to addPreferencesFromResource ? Yes, they are already deprecated and Google suggests if you’re developing for Android 3.0 (API level 11) and higher, to use a PreferenceFragment to display your list of Preference objects. Great tutorial, very easy to follow. Thanks for sharing. i m doing same thing but i want to sort my list so can anyone tell me how can i handle the radio button checked event?? Android research blog – Good work. I create 10 new activities of my friends name with phone numbers . I just want to call from there with a button click and return back after call ended to d activity, not to d main activity. plz guide. I almost make d project but after ending the phone call it returns to d main activity.